No, it’s fine. I have a one year old. I’m fine. So here we are! The last update. Because as much as I’d love to be “that mom” who keeps this thing going until she’s 18, it’s not going to happen. +Pulling herself up and crawling everywhere. She took a little while to crawl on all fours, she’s been shuffling and army crawling for a while, but finally got up right around her birthday. And homegirl can book it. She loves to walk along the couch and fireplace, and can move with the little walker helper thing we got her. Technical term of course. +Got dedicated to the Lord! Such an amazing thing to do. I can write a whole post on this…probably should. But! God has chosen US to be her mom and dad. To raise her up in Him. So cool. And so lucky because she’s the best. +Still chomping down with eight teeth. Although I think the ninth is on the way…today. +Made it through her first hurricane! Looking at you Hermine. Which I called Hermione all weekend. Mommy on the other hand, had a panic attack when it came through. But we’re all good. +She is so excited that football is finally back! She watches it. Duh. +Officially off formula *choirs sing songs of praise*. Not off the bottle yet, mommy isn’t ready. But we’re working on it. +Loves to go get the mail in her new pink car and swing on her new swing set. Grandmas for the win. +Got her first virus. That sucked. 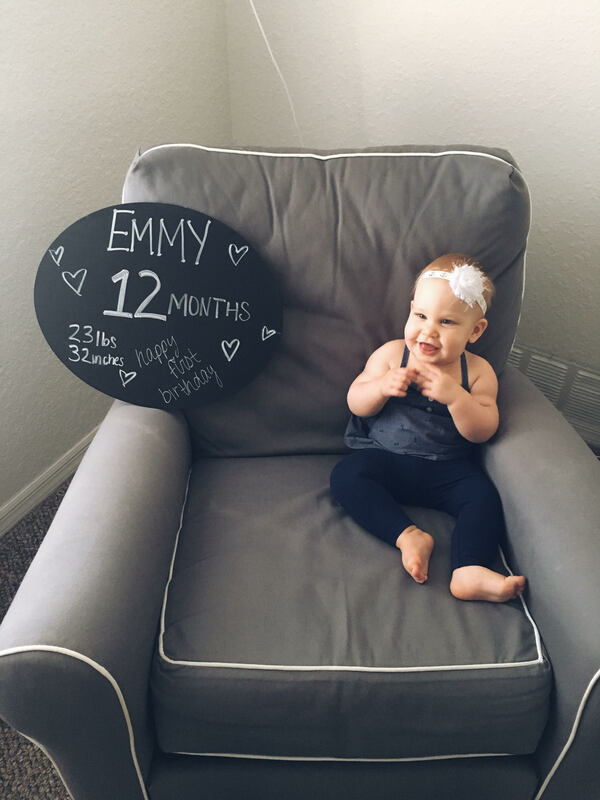 +Celebrated her first birthday! Elmo themed party. Pictures to follow later. T W E L V E MONTHS! She is absolutely ADORABLE! That first birthday is such a mix of emotions – happy/sad/overwhelmed/where the heck did a whole year go? thank you! and gosh is it ever!! it’s so much fun the older she gets, but best believe there were a lot of tears shed looking back on those newborn photos!